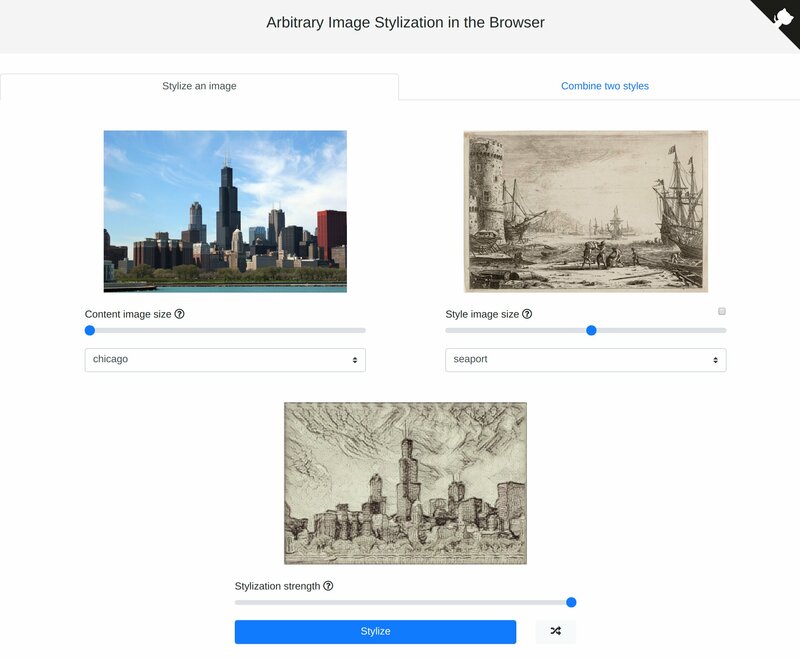 This repository contains an implementation of arbitrary style transfer running fully inside the browser using TensorFlow.js. This is an implementation of an arbitrary style transfer algorithm running purely in the browser using TensorFlow.js. As with all neural style transfer algorithms, a neural network attempts to "draw" one picture, the Content (usually a photograph), in the style of another, the Style (usually a painting). 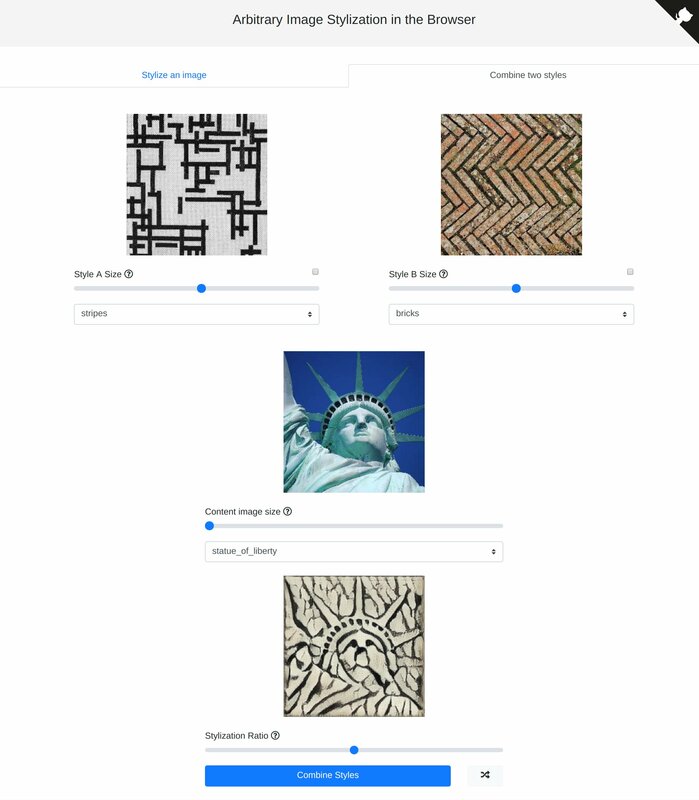 Although other browser implementations of style transfer exist, they are normally limited to a pre-selected handful of styles, due to the requirement that a separate neural network must be trained for each style image. Arbitrary style transfer works around this limitation by using a separate style network that learns to break down any image into a 100-dimensional vector representing its style. This style vector is then fed into another network, the transformer network, along with the content image, to produce the final stylized image. I have written a blog post explaining this project in more detail. Is my data safe? Can you see my pictures? Your data and pictures here never leave your computer! In fact, this is one of the main advantages of running neural networks in your browser. Instead of sending us your data, we send you both the model and the code to run the model. These are then run by your browser. What are all these different models? The original paper uses an Inception-v3 model as the style network, which takes up ~36.3MB when ported to the browser as a FrozenModel. In order to make this model smaller, a MobileNet-v2 was used to distill the knowledge from the pretrained Inception-v3 style network. This resulted in a size reduction of just under 4x, from ~36.3MB to ~9.6MB, at the expense of some quality. For the transformer network, the original paper uses a model using plain convolution layers. When ported to the browser, this model takes up 7.9MB and is responsible for the majority of the calculations during stylization. In order to make the transformer model more efficient, most of the plain convolution layers were replaced with depthwise separable convolutions. This reduced the model size to 2.4MB, while drastically improving the speed of stylization. This demo lets you use any combination of the models, defaulting to the MobileNet-v2 style network and the separable convolution transformer network. How big are the models I'm downloading? The distilled style network is ~9.6MB, while the separable convolution transformer network is ~2.4MB, for a total of ~12MB. Since these models work for any style, you only have to download them once! How does style combination work? Since each style can be mapped to a 100-dimensional style vector by the style network, we simply take a weighted average of the two to get a new style vector for the transformer network. This is also how we are able to control the strength of stylization. We take a weighted average of the style vectors of both content and style images and use it as input to the transformer network. This project uses Yarn for dependencies. To run it locally, you must install Yarn and run the following command at the repository's root to get all the dependencies. You can then browse to localhost:9966 to view the application. Authors of the arbitrary style transfer paper. The Magenta repository for arbitrary style transfer. Authors of the MobileNet-v2 paper. Authors of the paper describing neural network knowledge distillation. Google Colaboratory, with which I was able to do all necessary training using a free(!) GPU. As a final note, I'd love to hear from people interested in making a suite of tools for artistically manipulating images, kind of like Magenta Studio but for images. Please reach out if you're planning to build/are building one out!